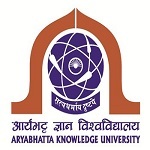 The Aryabhatta Knowledge University, Patna was established in the year 2008 under the aegis of Bihar Government for the progress and organization of instructive communications correlated to medical, technical, management and related professional teaching in the state. The institute is affiliated to Public University and approved by the University Grants Commission (UGC). The Aryabhatta Knowledge University is located in Patna, near Chanakya National Law, University Campus, Mithapur Farm Area, Mithapur, Patna, Bihar. The Aryabhatta Knowledge University, Patna offers many types of facilities to the students such as Separate boys and girls hostel facility, Library facility, Laboratories facility, Internet facility, Seminars and workshop facility, Medical facilities, Computer lab facility, Games & Sports facility, Canteen facility and Transport Facility. The Aryabhatta Knowledge University, Patna has training and placement cell is reportedly cooperating with diverse trades to recognize the opportunity of training and chances of placement for the students. The cell conserves usual communiqué with the managements of society world with an aim to offer the direction to the students in getting guidance and suitable service. Also, the Institute arranges the personality development programs, seminars and workshops for the students.